Closer to professional studio monitors than consumer bookshelf speakers, these beauties punch way above their weight class. I was impressed with the last set of Edifier speakers I tested, the $250 Luna e25, but those absolutely pale in comparison with the $400, S2000 Pro the company sent this time. 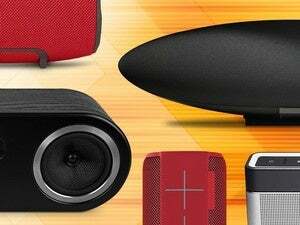 At reasonable volumes, the S2000 Pro compare favorably with professional studio monitors, such as my Yamaha HS8 ($350 each at Amazon), and they blow away the average Bluetooth units. Considering they cost less that the single-unit Bluesound Pulse Mini I just reviewed, they’re a heck of a bargain. In my experience, people fall into two camps with wood—they love it or hate it. But I’m not so sure the S2000 Pro won’t attract some crossovers from the hater camp. The sides and top are covered with a thick wood veneer, which partially explains their heft. I like the look, but I must admit they might appear out of place if all your other components are black. The S2000 Pro are bi-amplified, with a Class D amplifier sending 50 watts per channel to 5.5-inch aluminum cone woofers and 12 watts per channel going to approximately 1-inch tweeters. There’s a heavy 5-meter cable that links the right and left speakers. The sound is worth it in our book, but if you’re looking for true wireless, look elsewhere. There are a plethora of connections on the backside of the speaker housing the amplifier. Besides the Bluetooth, there are optical and coax digital (up to 24-bit/192kHz—more on that later), balanced XLR stereo as well as RCA input/outputs, and a DIN connector for the 5-meter (16.4 feet) power/signal cable that runs between the right and left speakers. The S2000 Pro doesn’t support Bluetooth True Wireless Stereo(TWS), they handle the split themselves. It’s not as convenient, but it does avoid the occasional artifacts that TWS is prone to. There’s a volume control on the back of the right speaker, which also serves as the input selector button when you press it. Switching was a tad slow, but that’s about my only complaint about the S2000 Pro. Picky, picky. Easier is the sleekly stylish remote control that Edifier includes. 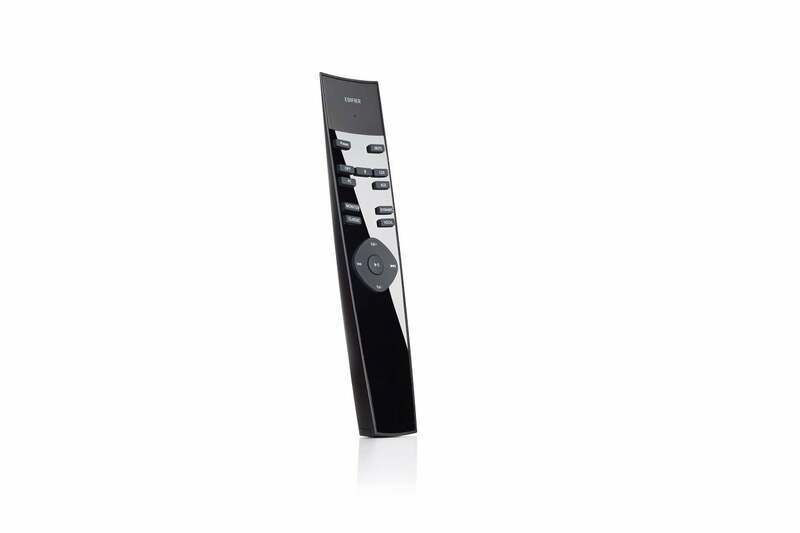 The S2000 Pro come with a remote control, so you can change input and EQ modes from the couch. The industry is rife with terms and specs that sound impressive but are absolutely meaningless if you know the science behind it. I’ve seen vendors selling platinum cables for absurd amounts of money, even though that metal is a far worse conductor of electricity than copper or silver. “Platinum is more expensive, therefore it must be better” is the patently false implication. BTW, gold plating is used because it’s soft and doesn’t oxidize, not because it’s a better conductor (though it’s a lot better than platinum). I will say that the S2000 Pro feature Burr-Brown converters (TI PCM1802), and it can decode signals with up to 24-bit resolution and 192kHz sampling rates. Not that the human ear can tell the difference from 16-bit resolution and 44.1kHz sampling rates, but to some people the numbers matter. The point is that it’s the top-end stuff that’s found in many pro audio interfaces. I found nothing to complain about audibly with the S2000 Pro, and that’s a very rare thing for me. Okay, perhaps the mid-range wasn’t exceptionally punchy, but punchy mid-range is tiring to the ear. I was recently kicking the tires of about 10 different studio monitors in various shapes and sizes before winding up with a pair of Yamaha HS8. The S2000 Pro sound almost as good as the Yamahas at normal volume levels. The S2000 Pro’s highs sounded distorted to me when I really pushed them, though I’m talking at uncomfortable volumes. The fact that I’m comparing these two speakers at all tells you a lot. The S2000 Pro also have more granular EQ capabilities. On the back of the right (as you face them) speaker are both treble and bass controls. The Yamahas only have a bass-cut switch. 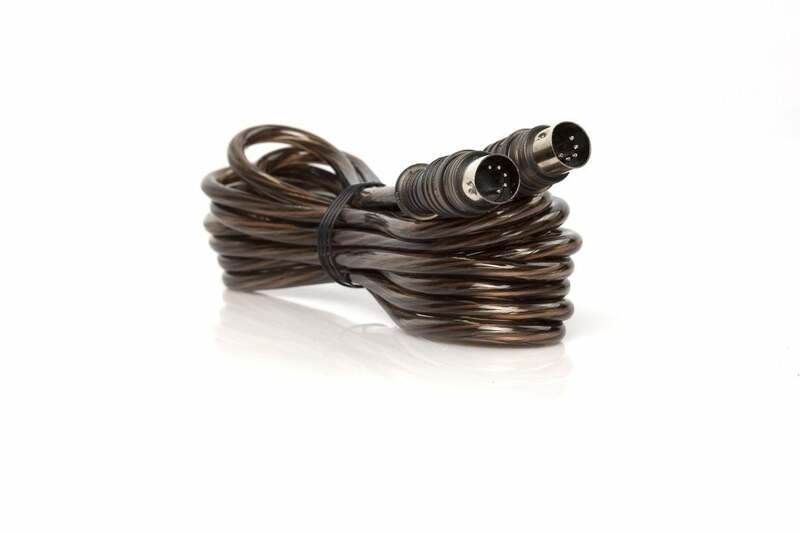 The S2000 Pro have a complete set of connections, from the mundane to balanced XLR. There are also treble and bass controls, with nicely musical curves. As if that weren’t enough, there are also four EQ modes accessible from the remote control: Vocal for performances, Monitor for electronic music, Classic for classical music, and Dynamic for watching movies or playing games. 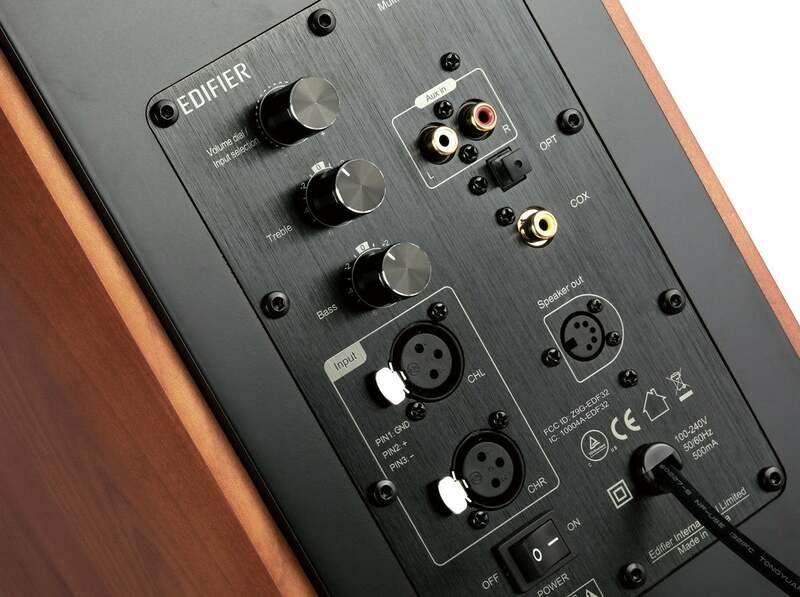 Those are Edifier’s descriptions, which I don’t particularly agree with. Monitor was the flattest EQ-wise, Classical had less bass, Vocal highlights the mids, and Dynamic is the old-fashioned Loudness button, adding some high-end sparkle and some thump. I liked Dynamic for general listening, and Monitor would be useful for mixing, but the S2000 Pro sound good right out of the box. I normally tell my friends to look at studio monitor pairs in the $500 to $800 range if they want truly good sound. 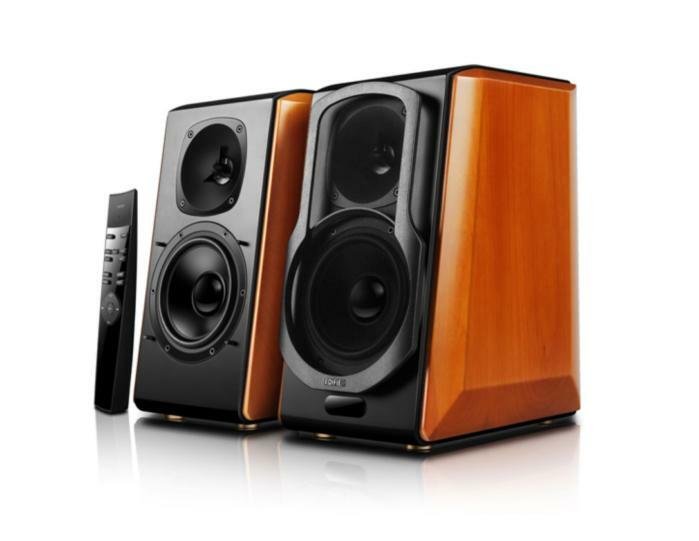 For all intents and purposes, the S2000 Pro are studio monitors with some more-than-welcome nods to home audio. You have to live with the wire, of course, but they’re a flat-out steal at $400. Note: This article was amended to correct mentions that the left speaker was the powered one, when actually it's the right speaker that's active.